We’ve heard his songs. We’ve anticipated his albums. Now, 21 Savage is the subject of burnt-out memes. On Sunday, rapper 21 Savage was arrested in Atlanta, Georgia by the U.S. Immigration and Customs Enforcement, according to ICE’s spokesperson Bryan Cox. ICE announced that the rapper is a British citizen and he came to U.S. in July 2005. The rapper was in the U.S. on a nonimmigrant visa that expired in July 2006, according to ICE. It’s heartbreaking and, truthfully, nobody should be laughing. But most people didn’t pray. Instead, they jumped straight to jokes. Conservative voices and “left-leaning” rap pundits alike seemingly mended like a Venn diagram on Sunday night. They joked that he was down with the red coats and that the gang violence he rapped about was more like Revolutionary War battles. 21 Savage is a 26-year-old black man. 21 Savage has no prior criminal record, according to his lawyer Charles H. Kuck. He’s a budding music star who could win a Grammy Award or two on Sunday. Most importantly, he’s a father of three. His situation is not uncommon, too. He just happens to be famous. ICE reported a 146-percent increase in arrests of people without prior criminal convictions in 2017. There was a 153-percent increase in Buffalo. ICE agents arrested an average 4,143 undocumented immigrants without prior criminal convictions in the first 14 months of the Trump administration, according to USA Today. In President Barack Obama’s last two years in office, there was an average 1,703 arrests a month. ICE arrests affect lives, still, the jokes came piling in from supposedly liberal faces on Sunday. Fantano, however, was an “ICE bootlicker finding joy in his deportation” less than 24 hours before Monday afternoon. And even those in public positions –– like ICE’s spokesperson Bryan Cox –– feel the need to play the role of the cultural critic. “His whole public persona is false,” Cox said. Why does Cox, a government spokesperson, think it’s appropriate to chime in on popular debate? What does he know about 21 Savage outside of a few trap songs? Is Cox gunning for Jeff Miers’ job at The Buffalo News? Is he submitting his resume to the Grammys pre-show next? Apparently, 21 Savage’s love for his city of Atlanta is all part of a “false” persona. 21 Savage has hosted three annual back-to-school drives where he offers kids school supplies and haircuts. Is this an indication of a phony man? Or maybe Cox thinks the rapper’s “Bank Account” campaign is a sham. 21 Savage announced the campaign on Ellen in March 2018. The rapper said he would give $1,000 to 21 teenagers to open their own bank accounts, to promote financial education, according to Okayplayer. For Cox and most of America, these achievements become citations on the rapper’s Wikipedia page. If we remodel “21 Savage” into a villain, a liar or a cheat then we fall victim to an erosive mindset. 21 Savage came to the U.S. as a child, although ICE’s report conflicts with what the rapper’s legal team claims. ICE said he came here at 12 years old, 21 Savage’s legal team said he legally came here at 7 years old. His visa expired in 2005, the team said, and he returned on a H-4 visa one month later. He’s been in the U.S. since that visa expired (which is not his fault, according to the rapper’s legal team). Was he supposed to turn himself in as a teenager? What teenager, who immigrated from another country, lives an autonomous life and can make decisions for themselves? If this is true, then he might qualify as a dreamer under the Deferred Action for Childhood Arrivals. Kuck, in a statement to Buzzfeed, said the rapper applied for a U-visa in 2017. U-visas are nonimmigrant visas for victims of crimes in the U.S. Kuck said that 21 Savage was a victim of a 2013 crime, in which he was shot and his friend died from murder. The application is still under review, according to Kuck. “As a minor, his family overstayed their work visas…,” Kuck said. “He, like almost two million other children, was left without legal status through no fault of his own." And the rapper certainly saw the Trump administration’s immigration stances as an issue. At the end of his hit song “A Lot,” the rapper ends his verse by addressing border security and immigration issues. He performed this verse during the Tonight Show with Jimmy Fallon on Jan. 29. Now, as we wait for his case to be in front of a federal immigration judge, we may see the rapper fill the role of so many families before him. And that’s something you can’t make a meme about. 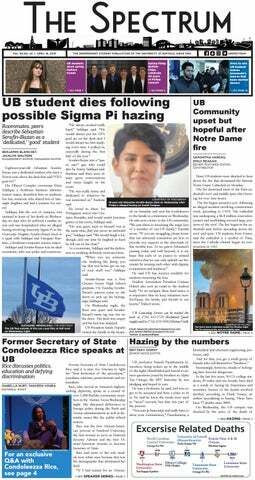 Benjamin Blanchet is the editorial editor and can be reached at benjamin.blanchet@ubspectrum.com.